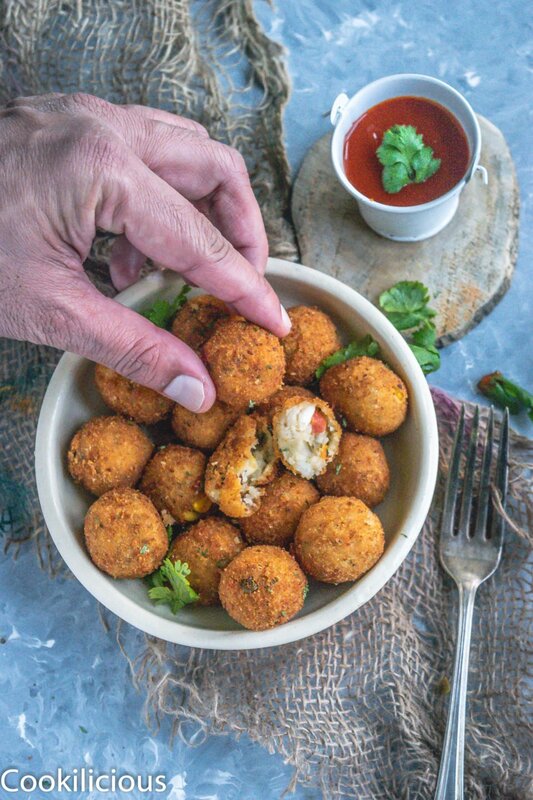 Semolina Vegetable Bites - Perfect Party Finger Food! 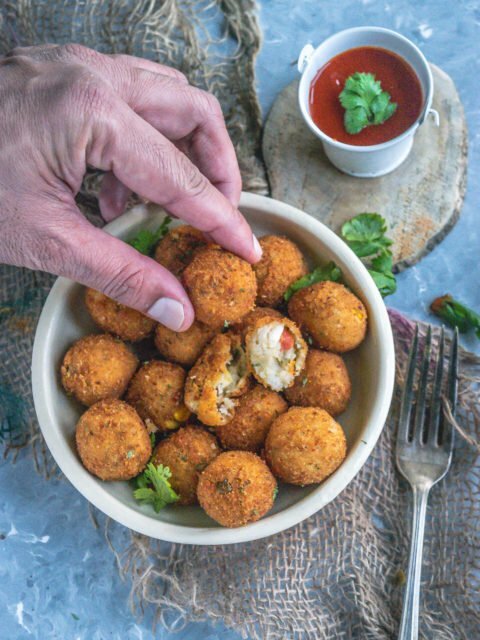 Semolina Vegetable Bites – Perfect Party Finger Food! 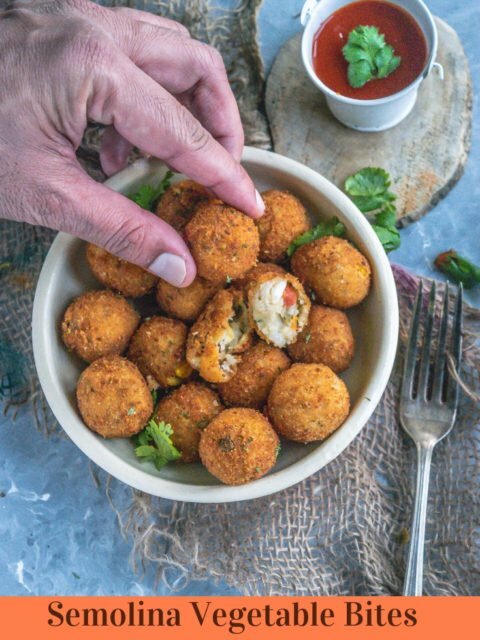 Become the party favorite by serving these delicious Semolina Veggie Bites! This easy vegan party appetizer is sure to impress all your friends & family! There are certain appetizers which stay with for a very long time even after they have been well digested. 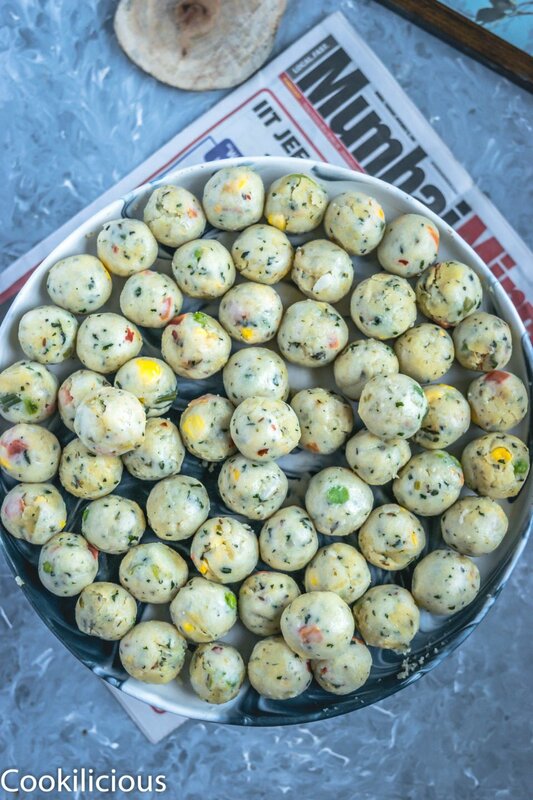 Semolina Vegetable Bites is one such dish. We all love party appetizers, don’t we? I come to a party mainly for the food and specially the finger-foods. Ever since I was in college, I loved playing host to friends. Back then, mom would prepare the food and I would help her in some way or the other. Since I also studied Foods & Nutrition in college, I loved experimenting with recipes since then. We would learn new recipes in our food lab and I would come home and try it out. I remember, on weekends, my brother and his friends would play cricket just outside my kitchen window and we lived on the ground floor. The aroma of whatever I was making would reach them and they would want a taste of it. Once, I was making Moong Dal Sticks for an evening snack. The minute the boys got a whiff of it, they wanted to taste it. I happily obliged and gave them some. They loved it so much that they wanted some more. Unfortunately, I had run out of bread so they went to the store and got it for me. I used that entire bread packet to make that snack for them. They relished it thoroughly and talk about it fondly till today. Such beautiful memories growing up! But that is the power of an appetizer. It has to be a crowd pleaser else its lost its purpose. Bite sized foods or finger foods need to appeal your guests instantly. Not only should it taste great but also look appetizing that they want to reach out and take some on their plate. The aroma itself should do half your job of enticing your guests with great food. Today when we host parties, I enjoy planning out the menu and take particular care on what I plan on serving as appetizers. I feel they have the power to make or break the tone of any get-together. 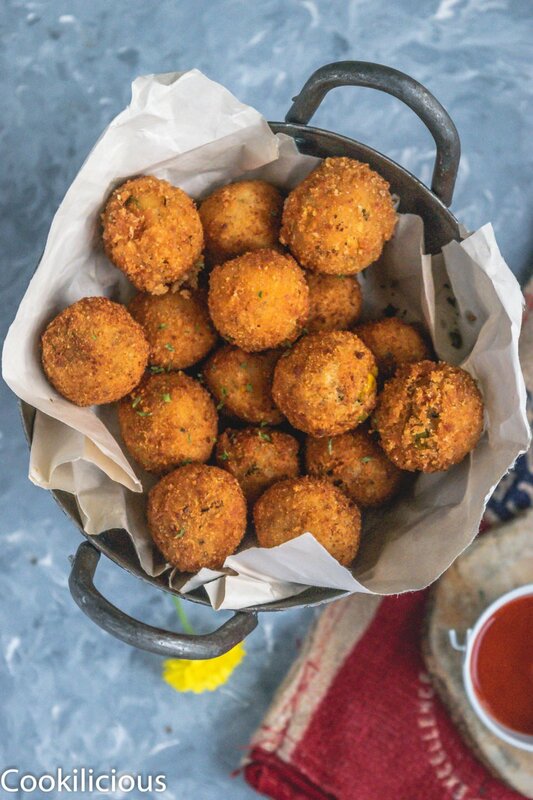 Whenever we call over friends for a casual hangout or a game night or on any festive occasion, I get the perfect excuse to try out fried or baked dish that are bite size. I feel that ways the fat gets divided and doesn’t harm any one person. It is just my way of looking at things. If I made these things just for the two of us, I know for sure that KR would finish it off in one sitting. That is why I reserve these snack recipes only when we are entertaining. 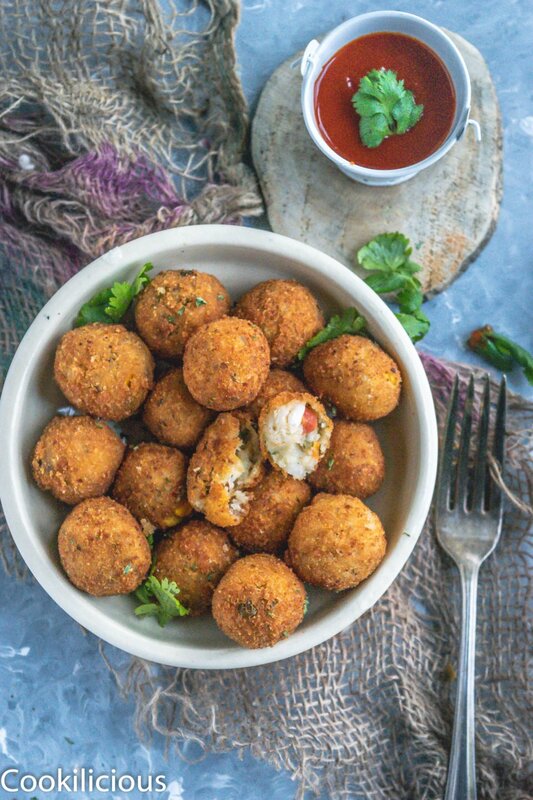 Semolina Veggie Bites have been on my list for a long time now. I saw a similar recipe on cooking show in India and had saved this idea ever since. The opportunity arrived when one of our friends hosted a potluck and I was assigned to make an appetizer. You can look at this dish in many ways. Some would say that this is a great way to use leftover upma while some would say that you can make this from scratch and no need for leftovers. Both statements are true in some sense. For those unaware, Upma is a delicious South Indian breakfast made with roasted semolina/rawa and veggies. It is a hearty and filling snack. 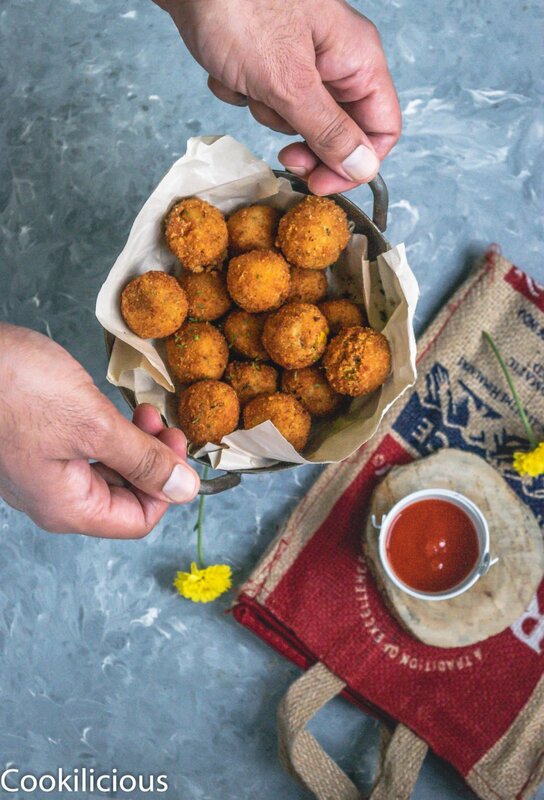 Now, this recipe is similar to making an upma which is then used to make these bites. I was sitting with my MIL when I saw this recipe on TV. We both took notes but never ended up making it, until now. Actually, Indians like to munch on something especially in the evenings along with their tea or coffee. For that reason, everyone is in search of a good evening snack recipe that is not just great to taste but also simple and quick to make. 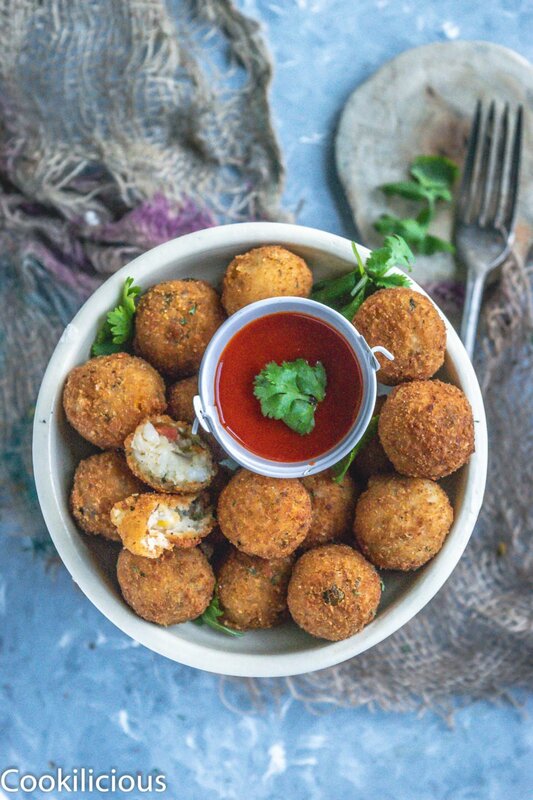 Semolina Veggie Bites definitely fits the bill. That is precisely why I decided to make this dish for our Potluck. I knew that this is one snack that all will love instantly and how right I was! I had made more than 50 pieces and they all got over within minutes of serving. I was super happy and glad that this recipe had worked like a charm. I had not given it any name until my friends kept asking me what this was.
. Keep stirring continuously so that the mixture boils and comes together eventually. It will not stick to the pan anymore. That is your cue. Take the pan off the flame. Add mashed potatoes, chopped cilantro, mint leaves, vegan cheese and salt. Mix all of this together. One part of the dish is done.
! Trust me when I say that this is a party favorite and a crowd pleaser. All will love it and you will get all the praises you deserve. Do make this for your next get-together and let me know how they turned out. We need roasted semolina/rawa for this recipe. Roast the required quantity and use or you can buy roasted semolina from the grocery store. Both will work. Heat oil in a pan. Once its hot, temper cumin seeds. Once they crackle, add chopped onion, minced garlic, ginger and green chillies. Saute till the raw smell disappears and onions turn translucent. Then add the mixed veggies like green peas, sweet corn, diced carrots and French beans. Add salt and cook till the veggies are done. This could take 3-4 minutes. Then add semolina and mix it with the veggies and roast it for 2 more minutes. Then add water and mixed herbs. Keep stirring continuously so that the mixture boils and comes together eventually. It will not stick to the pan anymore. That is your cue. Take the pan off the flame. Add mashed potatoes, chopped cilantro, mint leaves, vegan cheese and salt. Mix all of this together. One part of the dish is done. Grease a baking tray or a plate and spread this mixture evenly over it. Cover and refrigerate it for 30 minutes. This is done to set the mixture and to prevent it from breaking while frying. Do not forget to cover this else your mixture will dry up and crack. You can make this ahead and keep it in your fridge. Then cut and fry them on the day of your party. Take it out and either cut them squares or cut small pieces and shape them as lemon sized balls using your greased palms. Dip them in flour + water mixture and roll them over breadcrumbs. Fry them instantly in hot oil. Fry till they turn golden. Keep the flame low-medium and ensure you fry these balls evenly. You can fry them in less oil by frying them in an appe pan or you can shallow fry them if you have shaped them as squares. Vegan Semolina Veggie Bites are ready. Serve them hot with any chutney/ketchup! You can use regular shredded cheese if not vegan. Edamame Hara Bhara Kebab, Cheese, Rice & Methi Kebab With Tater Tot Stuffing, South Indian Medu Wada | Lentil Fritters, Black Rice & Chickpea Fritters, Masala Dal Vada/Lentil Fritters, Zucchini Bhajiya/Fritters, Moong Dal Bhajiya/Lentil Fritters, Paneer Cheese Corn Balls, Beet Leaves Sabudana Wada, Dill ke Pakode/Dill Croquettes, Dal and Poha Vada, Copycat Olive Garden Cheesy Fried Ravioli , Baked Bread & Chutney Rolls and Bombay Special Vada Pav are some snacks you can try for your next party!